Today we're making a quiche. If you go to youtube and look up how to pronounce quiche you'll find it's said Keesh. Not kish like so many people have said it to me in the past. Where they got that short i sound I'll never know but I digress. Quiche is an unsweetened custard pie. It's not scrambled egg pie like so many think. So what's the difference, right? A custard is more of an even blend of eggs and milk while scrambled eggs are mostly eggs. This is important to note, or the recipe will give you a bit of a panic when you see all that milk! First, preheat your oven to 350. Next, I cheated. There was an excellent sale on those refrigerated premade pie crusts that you just roll out, and I stocked up. Apple season was coming. It was necessary! So I have them on hand and since quiche is often a 'whatever you have on hand' dish, I used one. Start by draping your pie crust across a 9" pie plate and pressing lightly into place. Admittedly you should always blind bake a quiche crust, but not everyone cares about that kind of thing so if you do, go for it. If not, it'll still be fine just not as flaky...but that's ok.
Next your going to crumble the bacon and put that in the crust evenly. Chop your vegetables and add them to the pie. Sprinkle the cheese on top. In a large bowl beat eggs lightly. Add the milk to the eggs beating to incorporate. Mix in spices and add to pie crust. Bake 40 minutes or until mostly set. A little bit of jiggle is okay though! Remove quiche from the oven and let stand about 10 minutes before serving. Meats should all be cooked before adding. Veggies should be partially cooked or cut into pieces small enough to cook thoroughly during baking. Don't over beat the eggs. 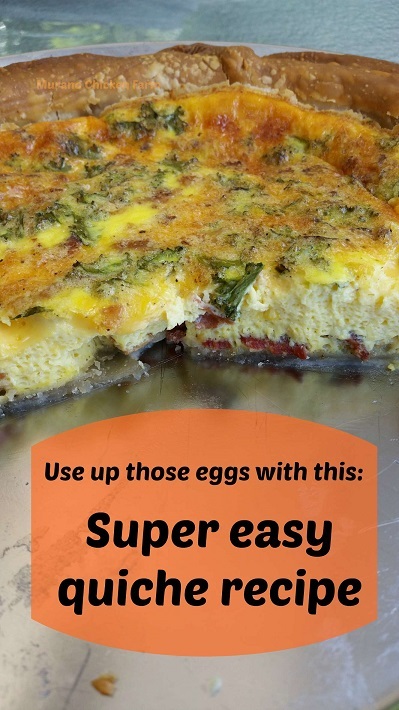 Almost any shredded or crumbled cheese can be used but a particularly strong flavored cheese could overwhelm your quiche. The proportions are important though so when using a strong cheese like Gruyere you'll want to only use 1/2 cup and add something milder like mozzarella to get to the 1 cup mark. Or use 1/2 cup each of sharp and mild cheddar. Offset blue with Monterey jack...you get the idea. Keep in mind the salt content of the cheese or meats when adding spices. For instance feta is particularly salty so you might want to skip salt when using it. This is a good chance to clean out the refrigerator! Leftover meats, last nights vegetables and odds and ends of cheeses can all be used. If it sounds like it would be good together, give it a try! Quiche can be served for any meal so do be afraid to experiment with different flavors and combinations. Enjoy! Have you ever heard of cloud eggs? They're whipped egg white with yolks in the center that look just like clouds! Check out my recipe for easy to make cloud eggs. I have not had a quiche in so long. Your recipe looks so yummy and I will have to give it a try! My kids love quiche and we do have tons of eggs. Thanks for the great recipe. Found you via the blog hop!